Just think: You are in charge of creating your future. It's a simple and highly motivational idea. 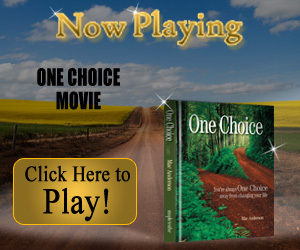 Watch the new inspirational movie about the power of choice. And remember, you're always One Choice away from changing your life. •Based off of Marcy Blochowiak's quote, "You are always one choice away from changing your life," One Choice is filled with quotes, stories, and beautiful photography. •15 short chapters on the importance and art of making the one choice that will change your life. •An ideal gift of inspiration for anyone looking to change their thinking and their life. Are you sitting on the fence of indecision awaiting the courage to take action? Mac Anderson invites you to begin changing your life, and encourages that it starts with only one choice. In One Choice, Mac Anderson, the founder of Simple Truths will introduce you to people from all walks of life who made life-changing choices. Whether it's switching careers, losing weight, finding financial freedom, adopting a child, or giving back to others, if you have the courage, you could make any one of these choices today and you would change your life.